Double Dave’s Thanksgiving Pizza is the perfect way to use up leftovers from your Thanksgiving feast. 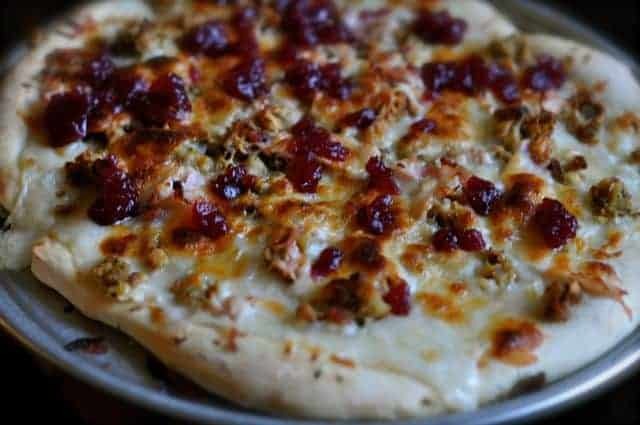 This pizza combines stuffing, brown gravy, onions, mozzarella cheese, chopped turkey, and cranberry sauce. I was out recently scoping out restaurants for new ideas when I came across this Thanksgiving pizza. Personally, I like very conventional pizza, I love pepperoni and cheese. I never thought I would enjoy this fun pizza. The gravy is a nice substitute for the tomato sauce. This pizza is very savory, but the added touch of the tart and sweet cranberry sauce makes for a pizza that will become a family favorite. Double Dave's Thanksgiving Pizza is a great way to use Thanksgiving day leftovers. If you do not have any turkey gravy, you can substitute chicken gravy.Preheat oven to 425 degrees. Spay pizza pan with a non-stick spray. Roll out pizza dough in pan. Ladle gravy over pizza dough, sprinkle onions over the gravy. Add stuffing, chopped turkey, and top with cheese to the pizza. Bake pizza for approximately 15 - 17 minutes or until cheese is golden brown. When pizza is removed from oven add the jelled cranberry sauce in small portions over the pizza. Prepared this last night for a family get-together and they absolutely loved it. Had the little kids cleaning off the plate. I just love it when you see your labor of love enjoyed by all. Thanks for the wonderful recipe.